Before the inception of interleague play, the Giants’ experience playing the Chicago White Sox in any games of importance was when the Sox beat the Giants in the 1917 World Series. Tonight the Giants start a two-game regular-season series against the White Sox. To mark the occasion, I’ve utilized Baseball Reference’s multi-franchise tool and comprised a team from the guys who played for both the White Sox and the Giants. In the case of these two teams, they’ve shared 142 players. I whittled that list down to a 25-man roster. I judged players on the strength of their peaks or whole careers, not necessarily how well they did in either Chicago or New York/San Francisco. Not a bad lineup and one likely to win a pennant if all are playing at their peak. If you have qualms about one of your players conspiring with gamblers to throw a game here and there, and are willing to sacrifice talent, maybe you take out Hal Chase and substitute New Orleans’ own Zeke Bonura. This is a pretty good bench. 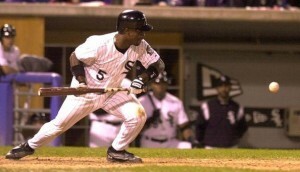 Amazing as Omar Vizquel was, he was not as good as George Davis, which I did not expect. Chalk it up to my ignorance about 19th century baseball and the men who played it. A Hall-of-Famer, Carlton was a washed-up 41-year-old by the time he pitched for the White Sox and Giants in portions of the 1986 season. But judged by their careers, this is a good rotation, and I especially like the underrated Thornton Lee. As with our Braves-Giants and Senators-Twins/Giants teams, the bullpen is a real strength, made possible by how modern relievers cycle through many teams over the course of their careers. This entry was posted in Uncategorized and tagged 1917 World Series, A.J. Pierzynkski, Bob Elliott, Bobby Bonds, Chicago White Sox, Danny Darwin, Dave Righetti, Don Larsen, Edd Roush, Ellis Burks, George Davis, George Foster, Hal Chase, Hoyt Wilhelm, Keith Foulke, Kenny Lofton, Michael Jackson, Omar Vizquel, Orlando Cabrera, Phil Douglas, Ray Durham, Ray Schalk, Rich Gossage, Sam Mertes, Steve Carlton, Thornton Lee, Wilson Alvarez, Zeke Bonura. Bookmark the permalink.